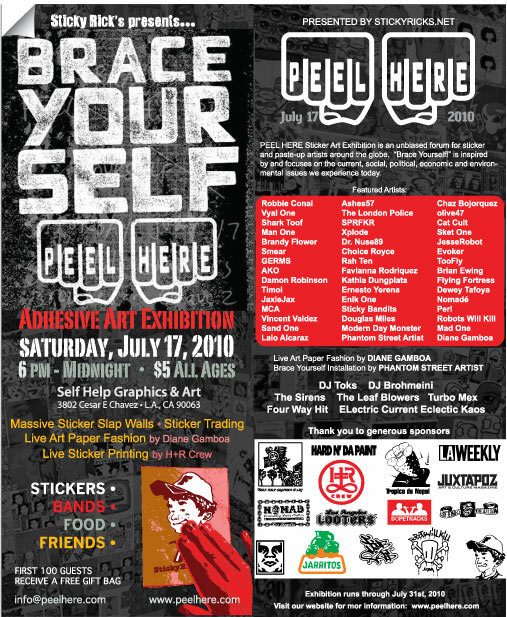 PEEL HERE is an unbiased forum for sticker and paste-up artist, we feature large scale sticker art in a gallery setting, along with interactive modules for our guests to slap stickers and add their tag. We will feature a MASSIVE STICKER WALL, STREET FURNITURE, STICKER TRADING ZONE, as well as “Open Call Submission” Sticker Installation. This year our theme is “BRACE YOURSELF!” which is inspired by and focuses on the current social, political, economic and environmental climate we live in today. Brace Yourself! the urban underground speaks. It’s time to get sticky. Bring stickers to add the to the MASSIVE STICKER WALL and trade with new friends in the PEEL HERE TRADING ZONE! Sometimes our ovarian cycles make us turn into ovarian psychos. Come ride off the stress and work out while connecting with other wombyn on the streets of Los Angeles. 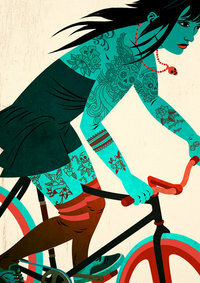 OVARIAN PSYCHOS/CYCLES.. wombyn’s cycling krew. 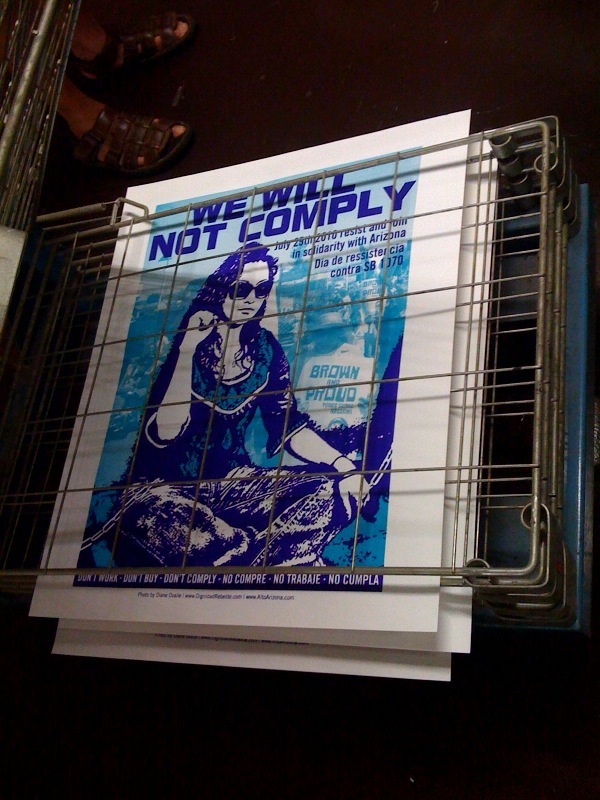 In a show of solidarity against the anti-Latino/a and immigrant sentiment in Arizona and the 30 days 30 actions campaign currently going on, artist from here in East L.A. and the Bay area organized a 12 hour print-a-thon, silk screening more than 1,000 posters, some stickers and shirts with various designs for the July 29 action taking place in AZ against SB 1070. Joel “Rage” Garcia and Melanie Cervantes first got the ball rolling for the print marathon after discussing solidarity work with the AZ coming up. Garcia along his partner/artist FelicaMontes , musician Olmeca and Vyal have been working with artist in AZ for the last few months. Doing organizing, connecting with artist there and helping them get the resources not found in AZ. 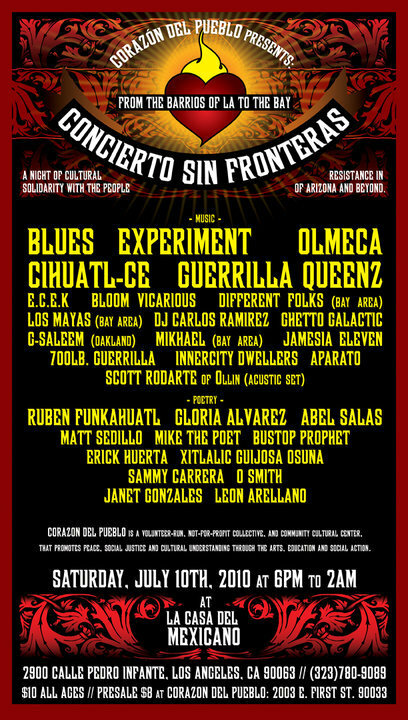 Cervantes and her partner Jesus Barraza at the same time have been working on the AZ campaign as well providing artistic resources and support with groups, orgs and individuals in AZ along with frequent partner and collaborator Favianna Rodriguez. Initially the plan was for everyone to go to AZ and do the work there, but contributing artist Ernesto Yerena warned them that the weather conditions and the AZ boycott would impede their productivity. Soon enough the conversation turned to printing here in L.A. and with the help of artist Dewey Tafoya, Self Help opened their doors to use the space and the marathon was on. Last summer while I was visiting my family out in Utah I tried my hand at working at a farm picking raspberries. My family did it every season because it was good money and the farm owners needed the help harvesting. I put in a days work and I said to myself never again. Picking raspberries out there wasn’t as labor intensive and demanding as picking grapes, lettuce and other foods out in the valleys here in California. Or having to live out there and breathing in all that pesticide and chemicals used out there. But half way into the day my arms were scratched up, I was sneezing, I had watery eyes from all the pollen and my back was already aching from all the bending. There’s no machine or technique for this kind of work. It has to be done by hand and with care, other wise it all goes to waste. The first of weekly Friday farmers markets at Boyle Heights’ Mariachi Plaza launched last week to the sounds of boleros and sweet scents of fresh produce. Vendors selling fresh fruits and vegetables from Oxnard, roasted peanuts by the Tiny Peanut Factory, homemade soaps and oils, Chicano-themed art, aguas frescas and coffee were accompanied by live mariachi music and a deejay from 92.3 The Beat. The vendors were small in number but the liveliness of the homegrown crowd were enough to keep the market in residence at the corner of 1st and Bailey. Market organizer, Juan Romero, who also owns and operates Primera Taza coffeehouse – a pebbles throw from Mariachi Plaza – says number of vendors will grow in the next few weeks. 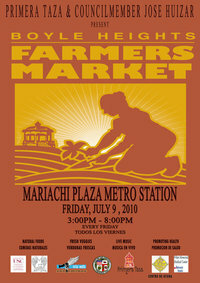 The market offers a great family atmosphere and an alternative in grocery shopping. Check it out! Posted on July 10, 2010 by EL CHAVO! Since it was such a ringing success, with encouraging comments like the one by Oscar that said “zzzzzzzzzzzzzzzzzzzzzzzz”, then I’m just obligated to continue my 2 random minutes of somewhere posts. Here we find ourselves in Chinatown, on N. Broadway and Ord. Wait for the crazy action towards the end. Came across this promotional video for East Los Angeles cityhood. If this new city is created, I hope they’ll be smart enough to keep out Wal-Mart…just sayin’. 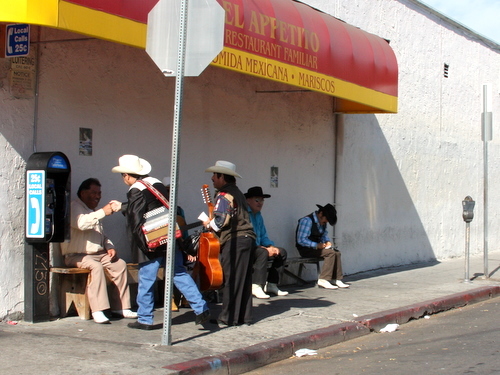 Get your huaraches on and join the rest of the Walking Class for a cool tour of Boyle Heights! 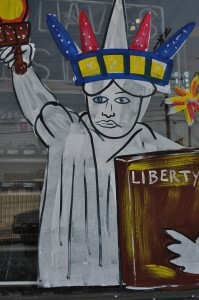 We will view art work that has been placed at La Casa through the Folk Art Everywhere project. Then we will hear about the art of mariachi garments from the owner of La Casa. From there, we’ll move on to explore the neighborhood on foot: from murals and architecture to porches and fences. The tour will involve walking approx. 1 mile roundtrip. I know Chimatli mentioned this already on Botanitas, but I have to plug it up again. Why ? Because there is an amazing line for that night. Musically and in spoken word. This is one of those events that you don’t wanna miss out on because if you do, you’ll be sorry when everyone else is telling you how much they had and how dumb you feel for not going. Fox News and Chris Blatchford = Culeros! Posted on July 4, 2010 by EL CHAVO! Its one thing for people to use some of the pictures I put online for their own purposes. A link back is the nice thing to do, though they often forget these basic manners. But its quite another when some lousy and supposed legitimate “news” racket borrows my stuff and they don’t acknowledge the source. And it’s even worse when its used for a purpose completely different then the original intent. 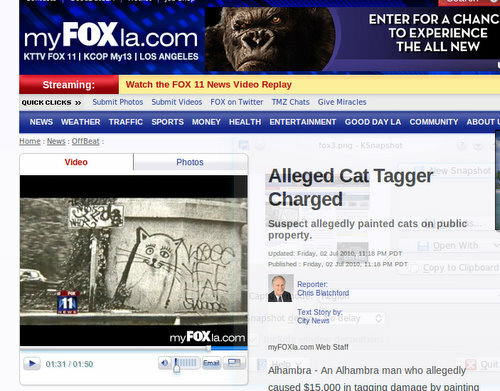 Take for example the pricks at Fox 11. What’s to Celebrate? That is the question. With all the racism, fighting, finger pointing, accusations, pettiness, warring, spectacle-ism going on in the US (and everywhere), what the hell is there to celebrate this weekend? Our overall family-macrocosm is pretty lame. Across the land people are in save-yourself mode —throwing everyone who is weak and without resources off the ship. Ok, well maybe we are not as bad as Belgian and France where freedom of religion is now an affront to “European culture”. I guess I should not be surprised that that cunita of racism is on-cue and tightening the reigns. In the 1930s Depression Los Angeles police positioned themselves at this state’s border to keep out starving poor white farmers from entering, there were massive deportations of Mexicans and their American born children, millions of people lost their homes/businesses, any poor person was an enemy to American life. Sound familiar? Personally, I like to learn from mistakes, even if they are not mine and not repeat them over and over like I’m punch-drunk. If we are going to survive what is happening within our families, communities, country and world with conscientiousness and honorability– we must think creatively, inclusively, differently, together. And then, that would be something to celebrate.